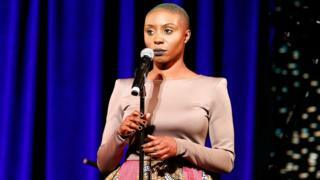 Singer Laura Mvula has revealed she found out she was dropped by her record label Sony via e-mail. In January, her former manager met the label and was told face-to-face that Mvula's contract would not be renewed. But the Mercury-nominated musician told the BBC that she only found out about it from a forwarded email, which was seven lines long. "I didn't see anyone, I didn't hear anybody's voice. I just read words. It felt so cold and cruel," she said. "Not even the fact that I was dropped, the way that the whole thing happened. To be treated like that doesn't feel quite just." Sony confirmed to the BBC that they had spoken in person to her manager informing him that they would not be extending the contract, but made no further comment. The 30-year-old singer was signed to Sony subsidiary RCA Victor five years ago, in a five-album deal. Her debut Sing to the Moon was released in 2013 and Mvula earned Brit, Mercury and Ivor Novello nominations, as well as Mobo and Urban Music awards. But her next album, The Dreaming Room, sold less well and failed to break into the top 10 when it was released in June 2016. Seven months later, Laura revealed on Twitter that Sony had dropped her. But she did not say how. "I was definitely naive in the beginning," she said. "When I was signed, I thought when someone says, we love you and we're with you until the end, that's what they mean." But, she laughed ruefully: "It doesn't work like that, it's business. Image caption Mvula said being dropped was a "huge wake up call"
"It's about money, it's about sales. And that has certain implications if you are not popular or there aren't enough elements in what you do that draws in the masses. "The album culture is, 'Momentum, please... when's the next record coming?'" She recalled receiving the e-mail, which thanked her for her efforts and wished her the best for the future. "First I was confused, I didn't understand. I was always told I was such a valued part of what Sony had become today - I was an artist who was taking risks and doing things that are fresh and genuinely new - I believed them. "I guess in my head I always thought there would be a conversation, a renegotiation, but never a kinda, 'it's over'. "It's been a huge wake up call," she added. Mvula remembered a conversation she had with her friend, the singer-songwriter Prince, before he died in April 2016. "He urged me, Mvula you have the music. Find the means to own your own thing and do it yourself. And at the time I remember hearing those words and thinking, yeah but you're Prince, it's all right for you. "But I think actually, now I reflect, I understand what he was saying. "I don't have any regrets, because I think we made," she corrected herself and laughed again, "I made two great records with them." But at a time when Mvula said she felt "rejected by the mainstream" she was asked to write the music for a new production of Antony and Cleopatra staged by the Royal Shakespeare Company. It is the first time she has composed for a professional theatre production. "This is a huge moment for me creatively," she said. But while Shakespeare and soul music may not seem obvious partners, the collaboration should not come as a surprise. Mvula studied composition at the Birmingham Conservatoire for four years. And she revealed that writing music for the tragic love story is a dream come true. "This is what I've wanted to do since I was 12 or 13, write music for theatre and film. And here's my first gig... and it's not a bad first gig." Mvula said she "knew immediately" how she wanted her music for the play to sound. "I had this palette forming that was somewhere between Prince's Purple Rain and Miles Davis's Sketches of Spain. "It's been brilliant for opening my mind again and my heart to a new dimension." She added audiences should expect plenty of "groove and funk". She said she has "no idea" what she will do next, but insisted there will be another album. "It's now time for a new season for me, as an independent artist, which is really more true to who I am and what I do. "Let what I do be in better hands," she declared. "Let me better understood and taken care of." Antony and Cleopatra opens at the Royal Shakespeare Theatre in Stratford-upon-Avon on 23 March, with a live screening into cinemas on 24 May.